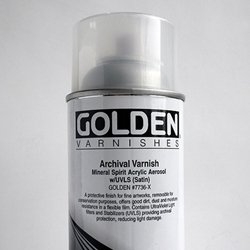 GOLDEN Varnishes offer several advantages to artists concerned about the longevity of their artwork. First, they are removable. Problems such as smoke damage, handling blemishes and dust or dirt accumulation on the surface of the painting can be removed along with the varnish. Second, GOLDEN Varnishes offer protection from UltraViolet (UV) rays generated from the sun. Third, varnishing consolidates the artwork with an even sheen. Gloss Varnishes can intensify colors while Matte or Satin Varnishes soften the color and minimize glare.